We provide Horizontal Directional Drilling in NJ, PA (Bucks, Montgomery & Delaware County), Delaware (DE), Maryland (MD) and New York (NY). We have extensive drilling experience, we use our own equipment, and we utilize environmentally friendly drilling procedures. Horizontal Directional Drilling is more cost-effective and time-efficient than other drilling options, and causes minimal surface disruption. At AmeriDrill, Inc. we provide not only exceptional drilling techniques, but we are a dedicated drilling company and we are committed to getting the job done right the first time. Our experience within the industry makes us a unique and effective HDD company. We provide you with the right tools and the right team to make sure that your expectations are not only met, but exceeded. Construction and roadwork are constantly being done in NJ, PA, NY, MD and DE. During these times there is often great disruption and inconvenience for those who are in the area. One of the most effective ways to work and install piping under roadways, established communities, and even rivers, railroads or other obstacles, is Horizontal Directional Drilling (HDD). HDD is the process of placing High Density Polyethylene (HDPE) pipe or steel conduits below grade using equipment that minimizes surface damage and restoration requirements. HDD allows you to utilize the directional drilling process without disrupting traffic or community. Because of this, Horizontal Directional Drilling is a great option for a more environmentally friendly way to drill. HDD is a multi-stage process consisting of drilling a pilot bore along a predetermined path. A radio transmitter located in the drill head relays pertinent telemetry to a remote radio receiver, which then translates the data to the operator, giving him depth, alignment and inclination from which he determines what he needs to do with the subsequent rods that follow, in order to maintain the desired path. Then the predetermined product can be pulled back through the drilled space. When necessary, enlargement of the pilot bore cross-section is accomplished by reaming. This can be performed as a separate step or in conjunction with pulling in the product, depending on ground conditions, length of crossing and hole size required. To ensure that your New Jersey (NJ), Pennsylvania (PA), Delaware (DE), Maryland (MD) and New York (NY) Horizontal Directional Drilling needs are met the first time, it is important to find an experienced and trustworthy HDD company, like AmeriDrill, Inc. AmeriDrill, Inc. has completed many HDD jobs in NJ, PA, DE, MD and NY. What makes us such a reliable and efficient drilling company is that we use top-of-the-line HDD materials and technologies. At AmeriDrill, Inc. we know what the right tools are for your drilling job that will save you both time and money. Whether your HDD requirements are to be performed under highways, railroads or waterways, our combination of outstanding horizontal drilling equipment and exceptional drilling team will increase productivity and control labor costs. This way you can be sure that all of your HDD needs are met in a timely and cost effective manner, ensuring that you will meet deadlines and budgets. 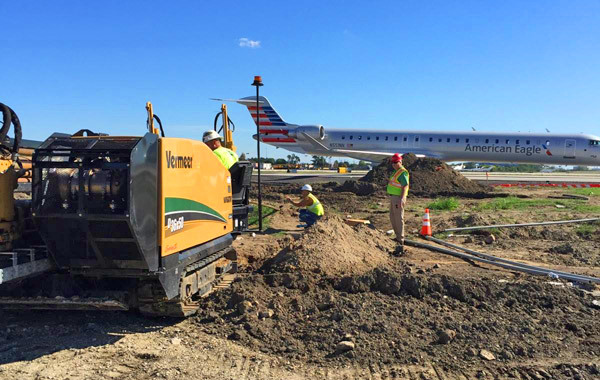 For more information on what AmeriDrill, Inc. can do for your Horizontal Drilling (HDD) needs, contact us today.